One of Egypt’s leading portrait and landscape painters in oil, pastels, and watercolor, Mansour has exhibited internationally in the Middle East, Europe, and the United States. Born in Cairo, Egypt, Mansour studied at the Egyptian Art College, Madrassa El Khoot El Arabia, and graduated with top honors from the American University of Cairo (AUC). 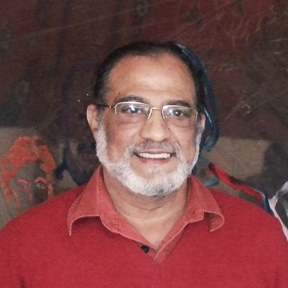 He has participated in many solo and group exhibitions and maintains a permanent collection at his gallery: Mansour Gallery, 22 El Mansour St, El Lasilky, Maadi, Cairo. In addition, Mansour is represented in many corporate, embassy, and private collections worldwide. Recently the Coca Cola Corporation commissioned 15 corporate paintings for their regional headquarters in Cairo, Egypt, and 5 were commissioned by the Oberoi Hotel chain and their Pharaoh Dinner Boats. He is a member of the American Portrait Society, Egyptian Syndicate of Plastic Arts, and the Cairo Art Guild. His work has been featured in The Egyptian Gazette, the Middle East Times, El Kwakeb, Ahram News, El Kzendreno (Italian Art Magazine), Nile TV, and Channel 1 TV, to name but a few. the world around him as it appears. His paintings help people understand and love the Egyptian way of life more deeply, and enrich their sense of the humanity and spirit within his country. Mansour’s paintings of Egyptian scenes and character studies are like a passionate song of love for his beautiful land. He is a virtuoso of color, spontaneous and elaborate, displaying sheer dexterity and manipulative skills. In every one of his paintings, be it oil, watercolor, or pastel, he shows his great sensitivity and sincerity towards life and nature. He is considered one of the most prominent painters in the Middle East and we hope you'll enjoy browsing through this website.